Steep by Bigelow is a premium line of 13 USDA Certified organic teas that creatively blends exotic, on-trend ingredients in unexpected and uniquely flavorful ways. 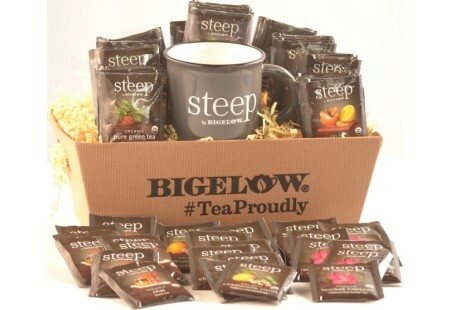 You’ll receive an eight pack of each 13 flavors, for a total of 104 individually wrapped steep by Bigelow tea bags. Included is a 15 oz. distressed, stoneware ceramic mug. The basket comes wrapped in cellophane with a fuchsia colored bow. Mug is microwave safe, handwashing recommended.